The FBI said it had located another Uzbek man whom it is questioning in connection with Tuesday’s attack. The man, Mukhammadzoir Kadirov, has not been detained or arrested. A law enforcement official told the AP Kadirov was a friend of suspect Sayfullo Saipov’s and may not have any role in the case. Investigators and prosecutors are assembling a portrait of the man accused of carrying out the deadliest terrorist attack on New York City since Sept. 11, 2001, as a recently radicalized immigrant who closely followed the ISIS playbook. Sayfullo Habibullaevic Saipov, 29, a native of Uzbekistan with no serious criminal record, was charged in federal court Wednesday with one count of material support to a terrorist organization and one count of violence and destruction of a motor vehicle. Donald Trump’s latest response was in a late night tweet, saying that the attacker should be given the death penalty. Earlier he promised stricter US immigration laws that let Saipov into the country declaring that he might send him to Guantanamo Bay. By sending Saipov to the military prison in Cuba it classifies him as an enemy combatant and would curtail his legal rights. “ We have to get much tougher. We have to get much smarter and we have to get much less politically correct,” added Trump. More is becoming known of the eight victims who died in the attack. Amateur video was taken of five Argentines who had been in New York to celebrate the 30th anniversary of their graduation. Two Americans and one Belgian citizen also died in the attack. Another dozen were injured. 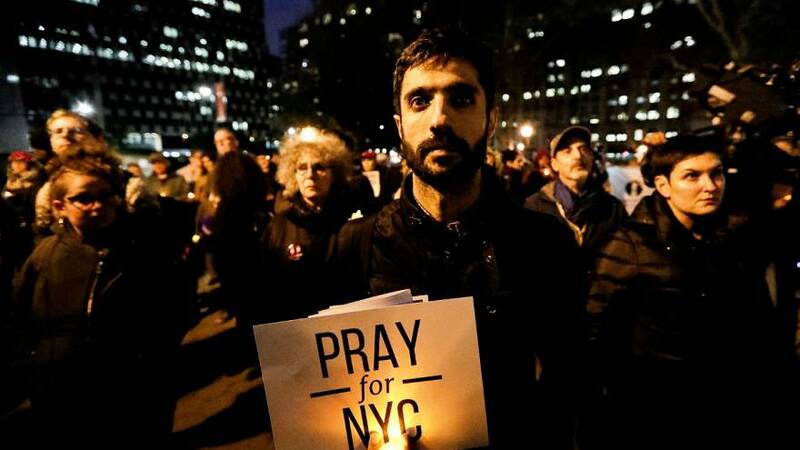 In a show of solidarity with the victims and their families, New Yorkers were joined by visitors to the city in holding a vigil.